The most common Context Menu that most people know and use is the Cell menu. This is the menu that you see when you right click on a worksheet cell or selection. The screenshot below is from the Excel 2010 Cell menu. menu added by the Microsoft add-in discussed later in this article. This example will add a custom button, built-in button (Save) and a Custom menu on top of the Cell menu. Other context menus that you can change are the Row and Column context menus for example.These are the menus that you see when you right click on the row or column headers. 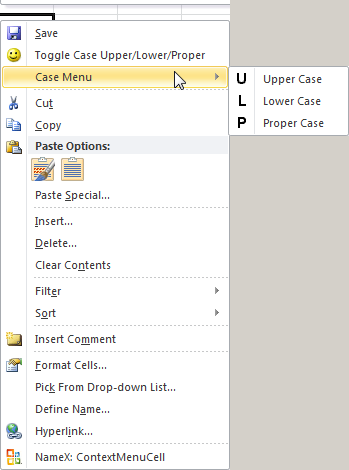 See the Tips section for a tip how to find the names of the other context menus. Note: There are two Cell menu's in Excel, the second one you see when you are in page break preview mode. If you want to change this menu use this then in the code. The same applies to the Row and Column context menus. Copy the six macro's below into a General module of your workbook. If you do not know where to copy the code check out this page. The first macro adds the controls to the Cell menu (see how I add a Tag to the controls I add). The second macro deletes the controls from the Cell menu (See how I use the Tag to delete the controls). The other four macros will run when you click on the Button or on one of the three options in the menu. As a example I use macro's that change the Case of the text cells in the selection. .OnAction = "'" & ThisWorkbook.Name & "'!" & "ToggleCaseMacro"
.Caption = "Toggle Case Upper/Lower/Proper"
.OnAction = "'" & ThisWorkbook.Name & "'!" & "UpperMacro"
.OnAction = "'" & ThisWorkbook.Name & "'!" & "LowerMacro"
.OnAction = "'" & ThisWorkbook.Name & "'!" & "ProperMacro"
Then save, close and reopen the workbook to see the changes in the Cell menu. In the VBA example on this page I showed you how to change the Cell menu and I used the Activate and Deactivate event of the workbook to call a macro to create and delete the menu controls. You can change the Activate event like this to create different menus for different users, this way you can create a menu with different sets of custom controls for different users. If you use the same Tags in the code there is no need to call a different macro to delete the menu. In the example above you will see no changes in the menu if you are not Ron de Bruin. See the two commented lines that show you how to call a different macro if another user opens the workbook. How do I find the name of the contextmenu that I want to change ? The example macro below will add button on the bottom of each contextmenu with the menu name. You will notice that you will not see a name on each context menu when you run it in Excel 2007-2013. For example, you will not see it when you right click on a shape or Picture in Excel 2007-2010. So it not seems to be possible to change these menus in Excel 2007-2010 with VBA.